Pot pies, or pot pie-esque dishes are the ultimate comfort food to me. I remember when my mom would throw a Marie Calendar’s Chicken Pot Pie into the microwave when she didn’t feel like cooking (she bought them in bulk at the Sam’s Club)… heaven. Absolute heaven. I think a lot of my gushier than normal food feelings can be attributed to my insane love for pie crust and peas, but a pot pie does me good. 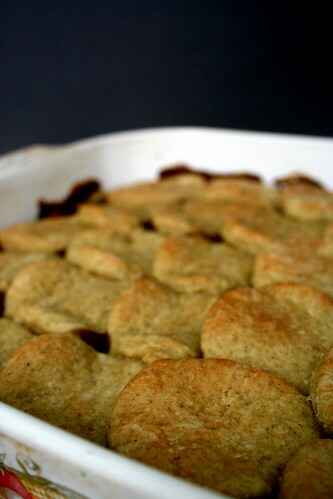 And what’s better than a spicy sausagey biscuit topped pot pie? Coat an 9×13 casserole dish with vegetable cooking spray. Preheat oven to 400 degrees. In heavy saucepan, heat vegetable stock over medium-high heat. Add onion and cook, stirring often, until soft, about 3 minutes. Add carrot, peas, lima beans, mushrooms, and sausage. If mixture begins to dry out, add 1/4 cup more vegetable stock. Cook, stirring often, 3 minutes. Reduce heat to low. Sprinkle flour over vegetable mixture. Cook, stirring constantly, 2 minutes. In glass measuring cup, combine soy milk and 2 cups vegetable stock. Slowly add to vegetable mixture while whisking constantly. Sauce will start to thicken. Add salt, soy sauce, thyme, sage, pepper and cayenne. Cook, stirring constantly, until filling is thickened. Remove from heat, transfer mixture to prepared casserole and set aside. Biscuit topping: In large bowl, mix flour, salt, baking powder and baking soda. Using a pastry blender or fork, cut butter or margarine into flour mixture until it resembles coarse meal. Add liquid to flour mixture, stirring with a fork to form a stiff dough. Knead lightly in bowl, 3 to 5 minutes, until dough is no longer sticky. Turn dough out onto lightly floured surface. Roll out into shape to cover casserole dish or cut into wedges (or circles). How funny, I too remember those Marie Calander pies. They have like 57 grams of fat in one serving. Crazy,but pre-veggie they sure were good. 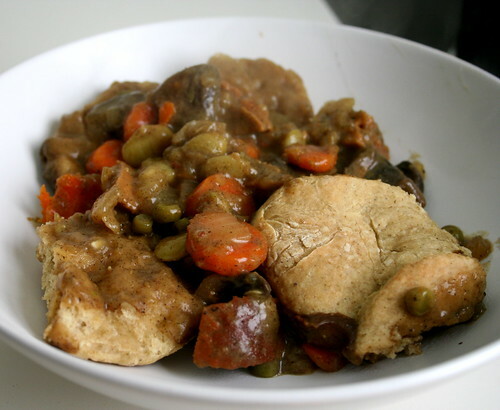 I am a sucker for a potpie, vegan that is. Love this dish! that is one lovely pot pie.. next time i make mine, i really must try to make it prettier. although, really, it’s the taste that matter, right? It sounds weird to me: biscuits as diner. But I know I really want to give it a try. Holy crap that looks sooooooooooooooo good!